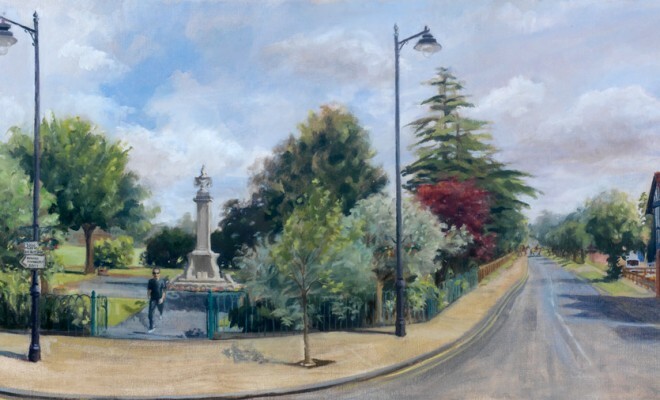 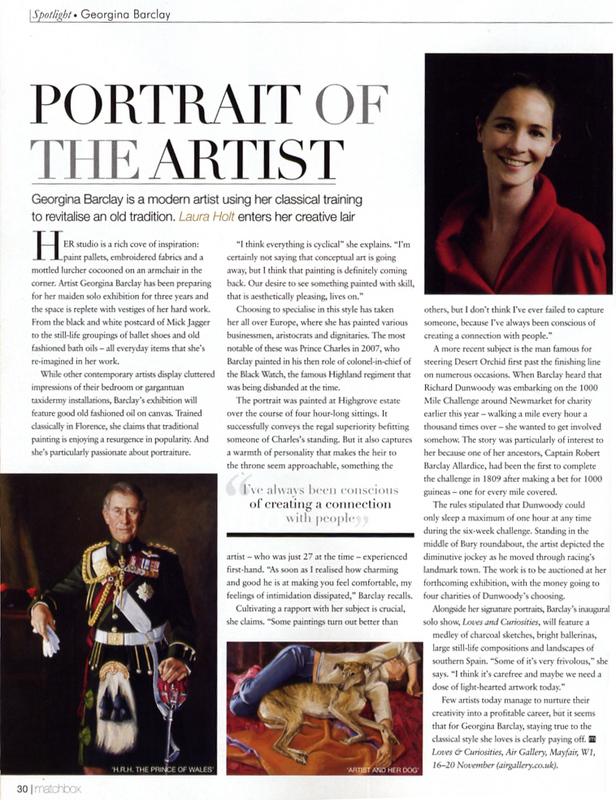 Georgina Barclay is a modern artist using her classical training to revitalise an old tradition. 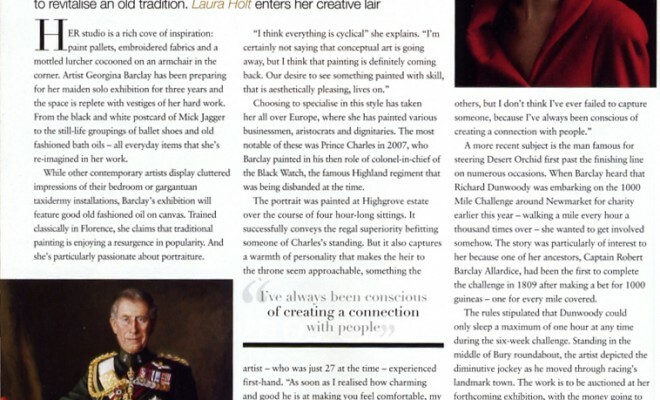 Laura Holt enters her creative lair. 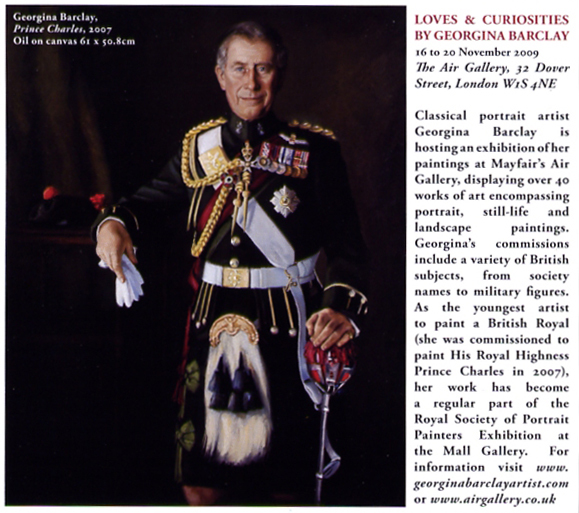 Loves & Curiosities By Georgina Barclay. 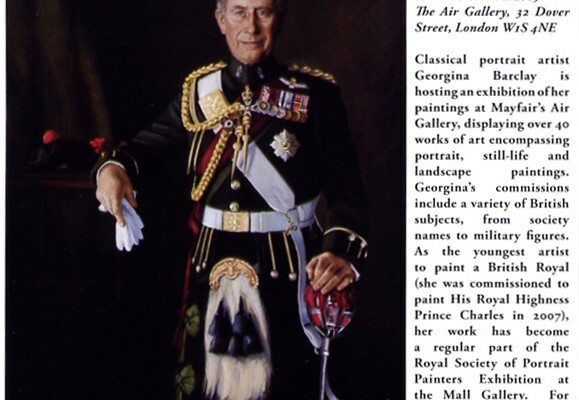 Classical Portrait artist Georgina Barclay is hosting an exhibition of her paintings at Mayfair’s Air Gallery…. 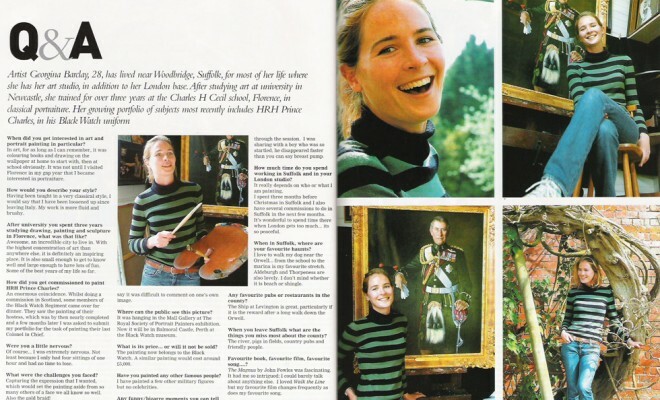 With studios ranging from a disused gas works to a Utopian dream of an artists’ commune and a charity-run studio complex, there is nothing uniform about these artists’ styles or approaches. 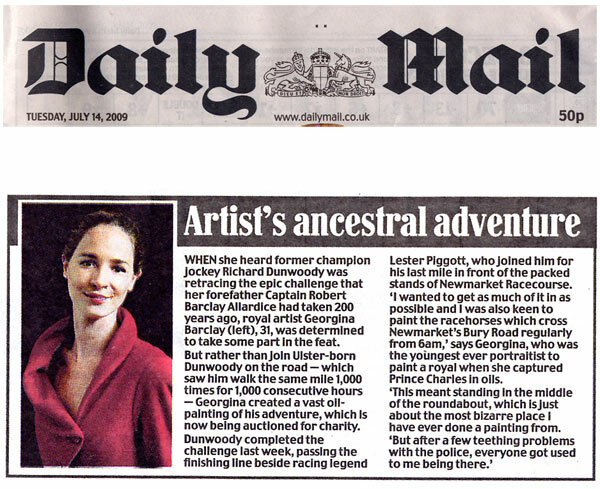 Classical portrait artist, Georgina Barclay, 30, has recently painted Richard Dunwoody during his incredible attempt of the ‘1000 mile challenge’ in Newmarket. 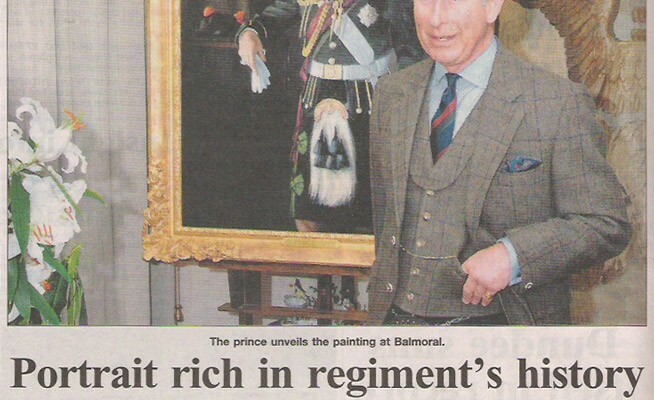 The painting is to be auctioned off for the challenge’s official charities: Alzheimer’s Society, Sparks, Racing Welfare and Spinal Research. 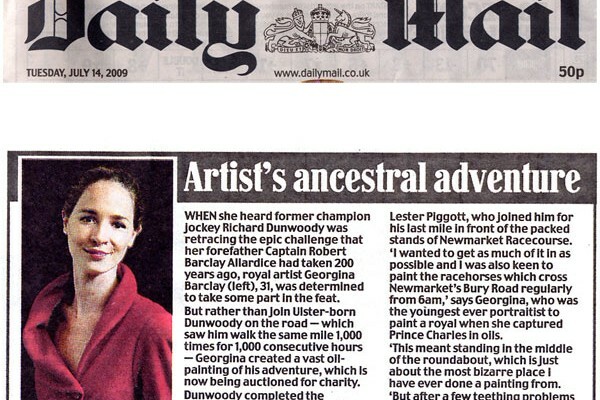 The Daily Mail – Artists ancestral adventure. 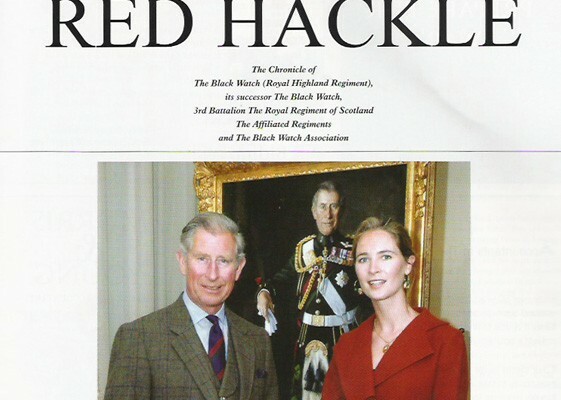 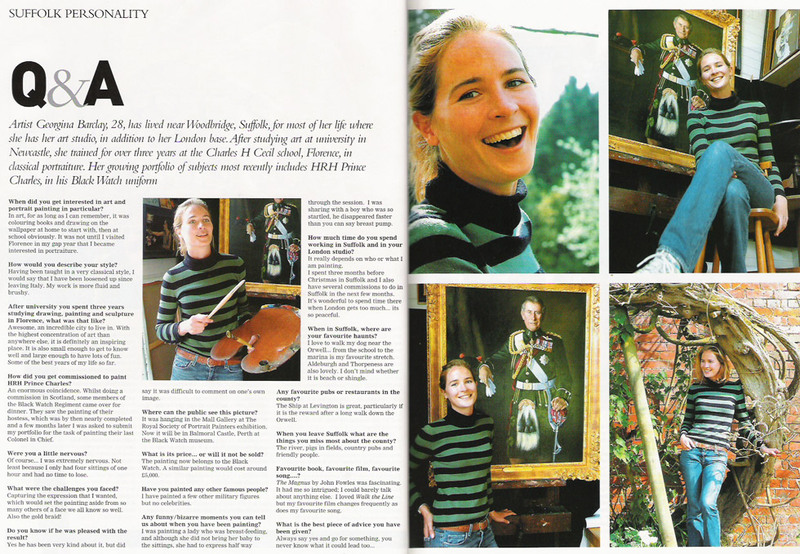 When she heard former champion Jockey Richard Dunwoody was retracing the epic challenge that her forefather Captain Robert Barclay Allardice had taken 200 years ago, royal artist Georgina Barclay, 31, was determined to take some part in the feat. 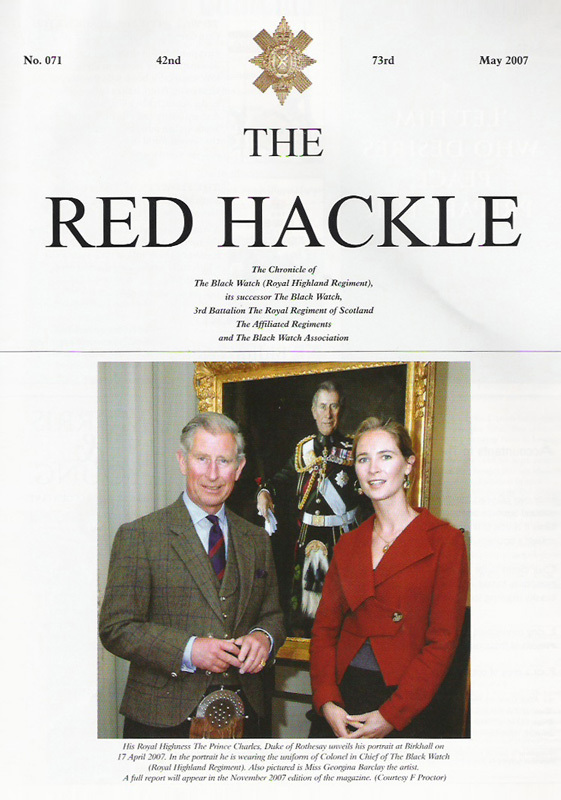 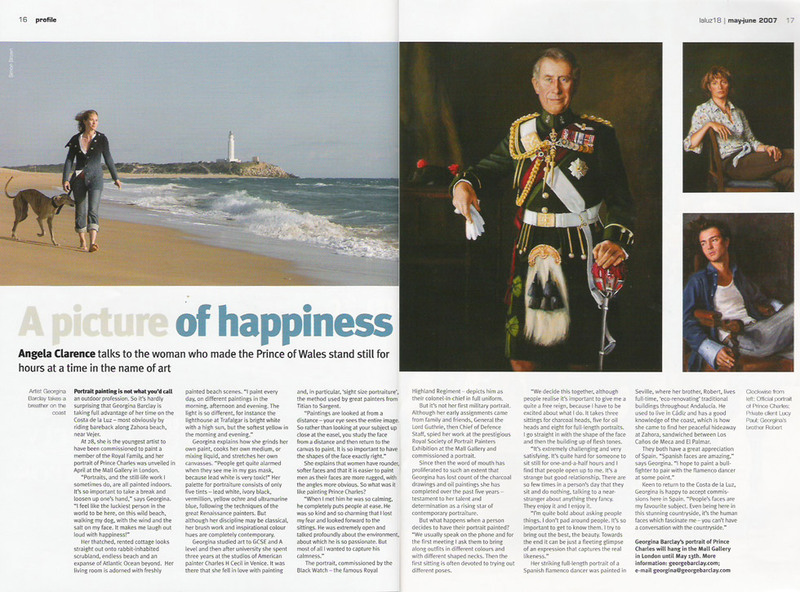 Angela Clarence talks to the woman who made Price Charles stand still for hours at a time in the name of art. 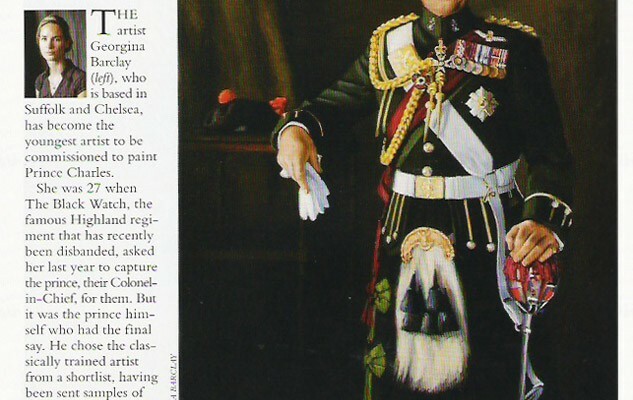 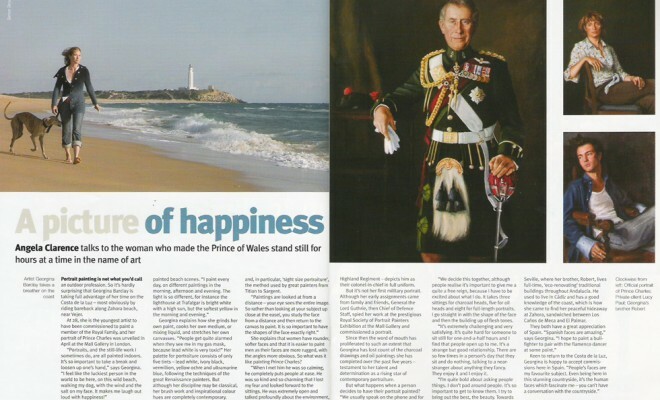 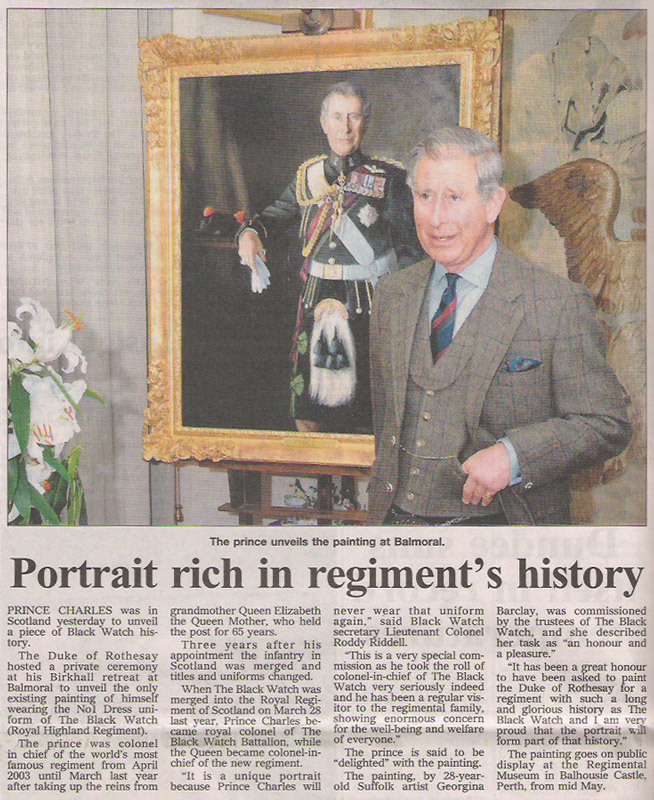 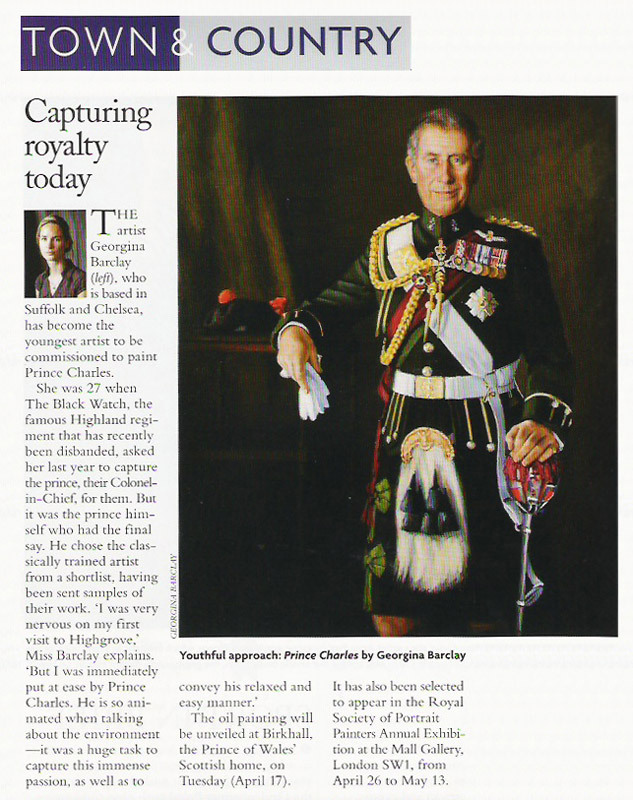 The artist Georgina Barclay, who is based in Suffolk and Chelsea, has become the youngest artist to be commissioned to paint Prince Charles.